I had a pretty ambitious eco-friendly challenge for January. I wanted to review all my Ragged Life packaging materials to make them as eco-friendly as possible… everything from my tissue paper and stickers, to my boxes and envelopes. So how did I get on swapping to eco-friendly packaging? First, a slight caveat to everything I write below… I’m no scientist or eco-expert and I just did the best I could based on what information was available to me. Although I set myself this challenge for January, the journey doesn’t end there. I’m going to keep an eye out for how I can keep making more positive changes to my packaging, so if you have any suggestions, please do send them my way or comment below 🙂 Equally positive reinforcement is good, so if you think I’m doing a good job then a virtual pat on the back is always welcome! Padded envelopes with bubble wrap inside are a nightmare to recycle, so most people (myself included) just shove them in the bin rather than painstakingly deconstructing them to recycle what you can. I needed to find a substitute that would still properly protect the tools and kits I send out (otherwise what’s the point), but would be a more eco-friendly alternative. After a good bit of browsing, I decided to switch to Jiffy Green Paper Padded Envelopes. Not only are these padded envelopes made from recycled material, but they’re also 100% recyclable. There’s no plastic involved and, as Jiffy manufactures all their envelopes in Cheshire, the air miles aren’t bad either. I even managed to offset the extra cost by moving to a small envelope. It was a good start! I swapped my bubble wrap lined envelopes (right) for Jiffy Green envelopes in various sizes (left). I tend to ship out my larger orders (Blanket Yarn and Ultimate Kits, for example) in cardboard boxes and, although they are a relatively eco-friendly form of packaging as they contain no plastic, I thought I’d do my due diligence and see whether my boxes were as green as they could be. Well, it turned out that all our Ragged Life shipping boxes were already 100% recyclable and FSC™ certified, which wasn’t too shabby. I plan to keep the boxes as plain as possible, so that they can be re-used by the recipient. Further down the line, I’ll probably design a stamp to encourage re-use. Even if the stamp has a minor impact, it’ll all be worthwhile. Watch this space! Cardboard boxes are already a somewhat eco-friendly alternative to plastic. Generally, I protect the items packed in my cardboard boxes with tissue paper, which is far more eco-friendly than other fillers like polystyrene pieces or bubble wrap. Well, it turned out that I was already using a tissue paper that was pretty much as eco as you can get. It comes from sustainable sources (FSC™ certified), is biodegradable and the dye is water based so is also considered environmentally friendly. Yay! I did, however, make a conscious decision to think a bit more about how much tissue paper I would include in my parcels as it’s always better to generate less waste regardless of whether it’s considered eco-friendly or not. Tissue paper makes the parcel feel more like a gift too! Our eco-friendly tissue paper protects your Ragged Life orders. I was feeling pretty chuffed that my boxes and tissue paper were already pretty eco-friendly, but I soon realised that I was being pretty naughty in using plastic masking tape to seal the boxes up securely. As someone who has experienced the struggle of peeling off layers of plastic tape to get inside a parcel, let alone for recycling purposes, I felt pretty guilty thinking about it. So, after a fair bit of research (who knew that tape was such a minefield), I decided to swap all my plastic masking tape to tesapack® paper ecoLogo®. I’m no scientist, so most of the finer details went over my head, but I was won around to this tape because it’s made from a high percentage of recycled materials, is 100% recyclable and the tape itself consists of unbleached paper with no harmful solvents. Essentially, this was pretty much the most eco-friendly tape I could find on the market. It sticks well too! I swapped all my plastic tape for eco-friendly and recyclable paper tape by tesapack. I’m not a huge fan of using plastic envelopes, but I have been known to use them occasionally in the past to send out hemmed hessian. This was mostly because they’re not very thick and therefore allowed me to send the hemmed hessian as a large letter (£1.35), rather than small parcel (£2.95) – saving you, the customer, money. However, after looking into things, I’ve decided that I really shouldn’t be using any plastic in my packaging. I’ve therefore decided to change all my plastic envelopes to cardboard sleeves from the same supplier as my cardboard boxes. They’re still thin enough to squeeze things through as a large letter too! I’ve decided to only use cardboard envelopes going forward. Even the inks printed on these envelopes are eco-friendly. I use two stickers in my packaging, but haven’t been able to come up with a more eco-friendly alternative yet. In January, I swapped out tin foil and cling film for beeswax wraps and elasticated bowl covers in my home. I was keen to use items that were reusable and had a lower environmental impact. So how did I get on? I bought a set of four organic cotton beeswax food covers from Penny’s Daughter. 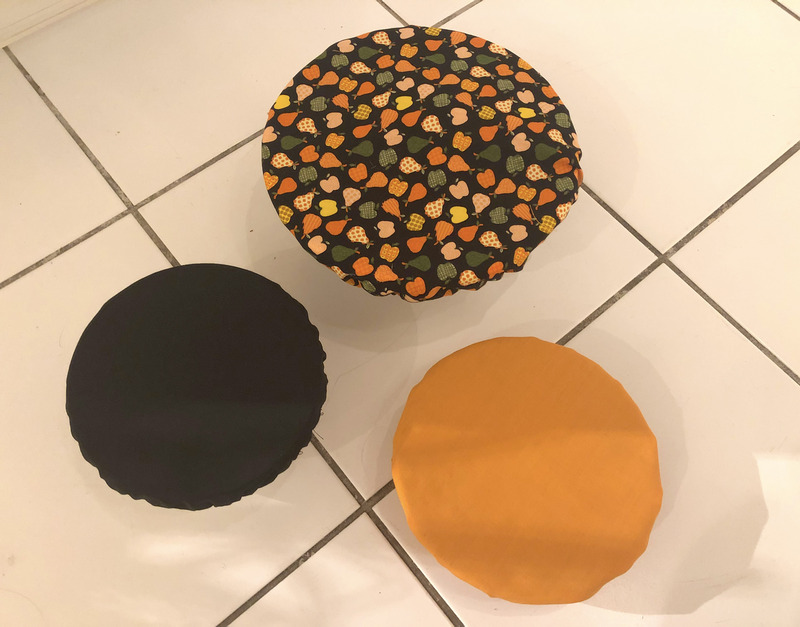 I bought this set of three elasticated bowl covers on Etsy but might make them myself next time. I was a little concerned that the beeswax wraps wouldn’t stick around containers all that well, but I was proven completely wrong. They were really easy to apply and stuck well. However, I found myself reaching for the elasticated food covers more readily as they were much quicker to put on. It was like the the convenience of a fitted sheet vs a flat one. The beeswax wraps stuck better than I thought that they would. Although I found the elasticated food covers easier to use, I think that the beeswax wraps were probably better at preserving food by keeping the air out. The elasticated food covers were made from a breathable cotton that would only be suitable for certain food stuffs (I wouldn’t put them over cooked meat products, for example). With both items, I found that they made my fridge look much more cheerful than it would have looked with cling film or tin foil. Maybe I just love fabric a lot, but seeing pretty patterns in the fridge never got old. To be honest, I didn’t miss cling film one bit. I don’t think I’ll ever go back to buying it. I did occasionally find myself reaching for where the tin foil would have been, but it was probably more out of habit than anything else. In just the one month, I got a lot of use out of both my beeswax wraps and elasticated food covers and I intend to keep using them until they need replacing (although I’m determined to make my own of each next time). Maybe I’ll even try making a hybrid of the two? I’m not sure how that would work, but I’m willing to give it a go 🙂 I’ll keep you posted about how the stickability of the wraps changes over time. I’ve only washed them a few times, so I’m intrigued to see how they stand up over time. Although apparently you can either re-treat them with beeswax or compost them and make another set. The only slight fault I could find with both products is the fact that they’re not transparent (which is mildly irritating when you can’t remember what you’ve left in a bowl) and you can’t really stack things on top of them (although that’s the same with containers covered with cling film and tin foil). As my London fridge is pretty small, the lack of stacking does cut down on available space, but I think it’s something I can live with. If I’m desperate for space, I have tupperware that I can use instead. In conclusion, I would recommend both beeswax wraps (or vegan equivalents) and elasticated food covers as a simple eco-friendly household swap for cling film and tin foil. If I can do it, you can too! SO WHAT’S IN STORE FOR FEBRUARY? I’ll be the first to admit that there are certain parts of the household management that I’m quite happy to pass off to my partner, Christian. Energy bills being the main one… I view them as a necessary evil. However, as temperatures drop, February is probably going to be one of our most energy intensive months, so I thought now would be a good time to look into substituting our gas and electricity supplier for a green energy alternative. This is my cold wintry view as I write this blog post. Green energy comes from renewable sources, rather than non-renewable sources like oil or coal. It cuts down on the negative impact on the environment by producing a smaller carbon footprint, which all sounds great in theory. What’s more, many green energy companies claim that because green energy has become more competitively priced in recent years, we may even be able to save some money too. It’s not the most ground-breaking of swaps this month, but I believe that February isn’t really a month for challenging yourself too much – it’s hard enough with the weather and lack of sunlight pushing you to your limits. So, my eco-friendly household substitute for February is a nice easy one – cotton make up pads. I don’t wear an awful lot of make up (in fact, I don’t wear it most days), but I still seem to go through a good pile of disposable cotton pads over the space of a month. With a name like “cotton pads”, you wouldn’t have thought that these snowy white circles would be that bad, but it turns out that most of them aren’t made entirely from cotton, but are instead made of a blend of synthetics. Doh! What’s more, they often have residues of bleach and fertilisers on them… yuck! I decided to take a look at what alternatives there were out there. I came across plenty of lovely crocheted make up pads and fabric ones. In the end, I bought a set of both to work out which product I preferred. If I’m going to be using these for years to come then I want to know that I’m using the best option after all. The crocheted cotton make up pads immediately appealed to my craft side as they looked so incredibly cute. I didn’t have time to make myself a set (and my crochet skills are a little rusty), but I bought a set from StrangelyMagical on Etsy as 10% of the sale price of all items in their store is donated to an NGO providing loans to people in developing countries. I felt like I was supporting a good cause. I chose darker colours as I thought that if there was any staining over time, it wouldn’t show up against these slightly darker colours. That was the theory, whether it would work is another matter. Eco-friendly Crochet Face pads from StrangelyMagical. Eco-friendly Crochet Face pads from StrangelyMagical on Etsy. I also bought a set of 10 organic cotton make up pads from Kate & Sunny on Etsy. Not only did I like the print that was on the rounds, but I was reassured by the fact that their pads are made from GOTS certified organic cotton, only using low impact eco dyes and they could be fully composted at the end of their life. Not bad! If I like these pads then it won’t be too difficult to make myself more as well. Which are better, the crochet pads or fabric ones? How will each of the pads stand up to washing? How many pads will it take to get my make up off? e.g. how many do I need so I’m not continually having to put on washes. Will they stain and look horrible and unhygienic over time? How do they feel on my skin? Are they scratchy or soft? This entry was posted in 2019 Eco Challenge and tagged 2019, 2019 Eco-Challenge, Eco-Friendly, Packaging, Sustainability. Bookmark the permalink.